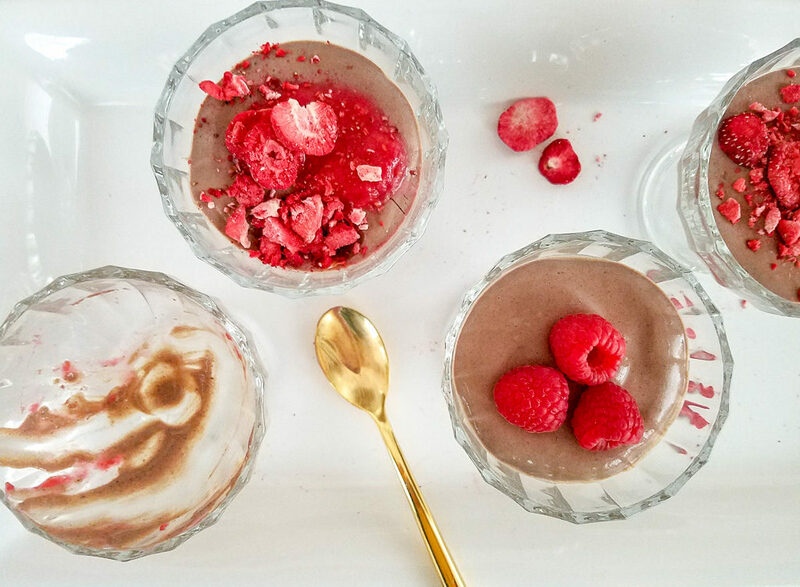 I’m postponing the blog post I had next in the queue in lieu of a quick little chocolate dessert in honor of Valentine’s Day. It’s distantly related to a chocolate mousse recipe from Cooking Light I use to make in the early 2000’s. So distant in fact, if they passed one another on the street they wouldn’t even recognize each other; their only shared traits now being they both use tofu and chocolate. The old recipe was a great “diet” recipe for creamy chocolate mousse but I’m betting it used some artificial sweetener and I remember it being quite a bit of work. The worst part was after sitting in the refrigerator for more than a day, it separated into what looked like a thick layer of mud floating atop a pool of murky brown water. Yummm…..Not. I’d all but forgotten all about this recipe until a few years ago when it occurred to me that I had once made chocolate mousse with tofu. That was pretty much all I could recall about the recipe so I crafted this version. 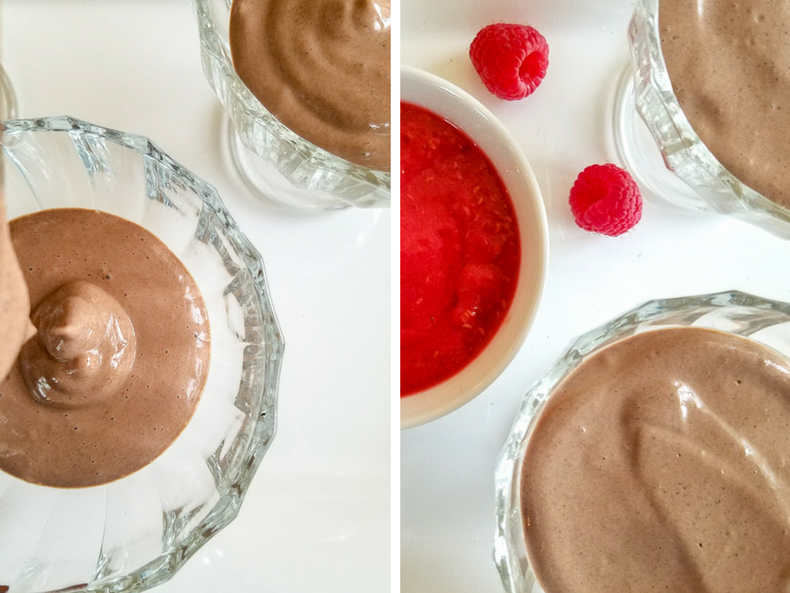 This one is not a mousse by definition, it’s more of a pudding but it’s simple and quick and involves no whipping, no folding in of previously whipped ingredient and no cooking. Just toss a few ingredients into a blender, pour into individual serving dishes and pop it in the fridge for about an hour to set up. 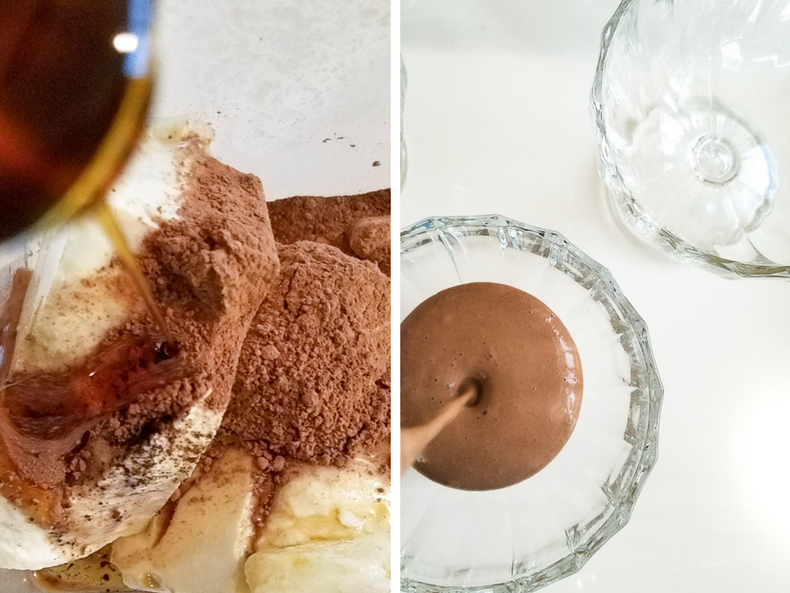 I sweeten it with maple syrup and use cacao powder rather than cocoa for its increased nutritional benefits. A bit of melted coconut oil helps the pudding to set up. I’ve made other versions as well; chocolate-peanut butter, lemon and a maple-bourbon that’s nice in the fall, but in honor of this February 14th I’ve topped this one with a tart raspberry puree and crushed dehydrated raspberries strawberries (*see below) to offset the silky sweet chocolate. Dehydrated raspberries are my preference here, if you’ve never had them they are delicious and have more of a real raspberry taste then some fresh raspberries I find in the store, especially when they’re out of season. I also like to toss them in oatmeal or on a yogurt smoothie bowl. 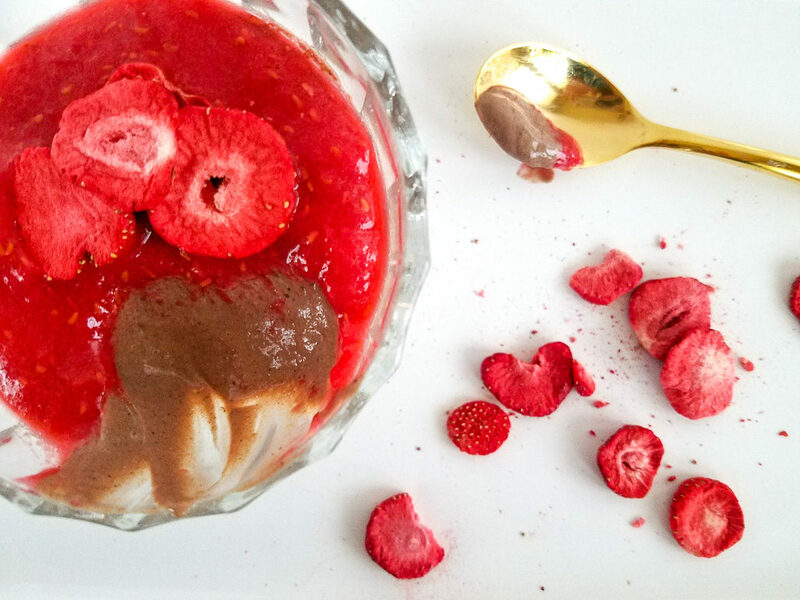 The basic chocolate pudding is good on its own but feel free to experiment with other toppings too; cacao nibs and toasted coconut come to mind, or nix the raspberry puree and just crumble on the dehydrated raspberries, or a scattering of fresh raspberries if you can find good ones. *As luck would have it when I went shopping for the ingredients to photograph this dish the store was out of dehydrated raspberries so I had to use dehydrated strawberries. I still prefer the raspberries but go with whatever floats your boat. Notes- I like to use a sprouted tofu but regular will do if you can’t find sprouted. Feel free to play around with different sweeteners here too, I fluctuate between maple syrup and amber coconut nectar but real honey or even liquid stevia, if you use that, would work. 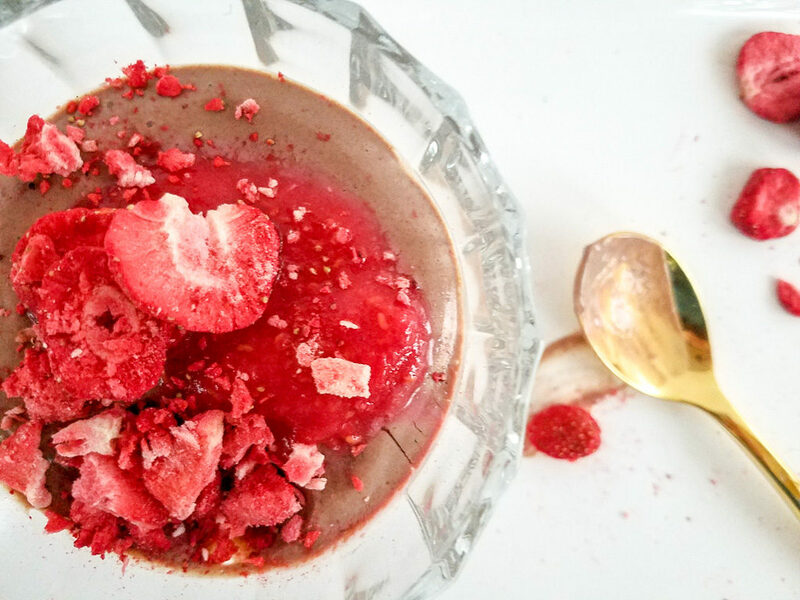 Optional toppings- raspberry puree (recipe below), fresh raspberries, crushed dehydrated raspberries or strawberries, unsweetened cocoa nibs, toasted coconut flakes. Combine the tofu, cacao, maple syrup, vanilla extract and salt in a blender or food processor and blend until well mixed, scraping down the side once or twice during blending. Once it’s mixed well add the melted coconut oil and process again until blended. Taste and add more cacao or sweetener to your liking. 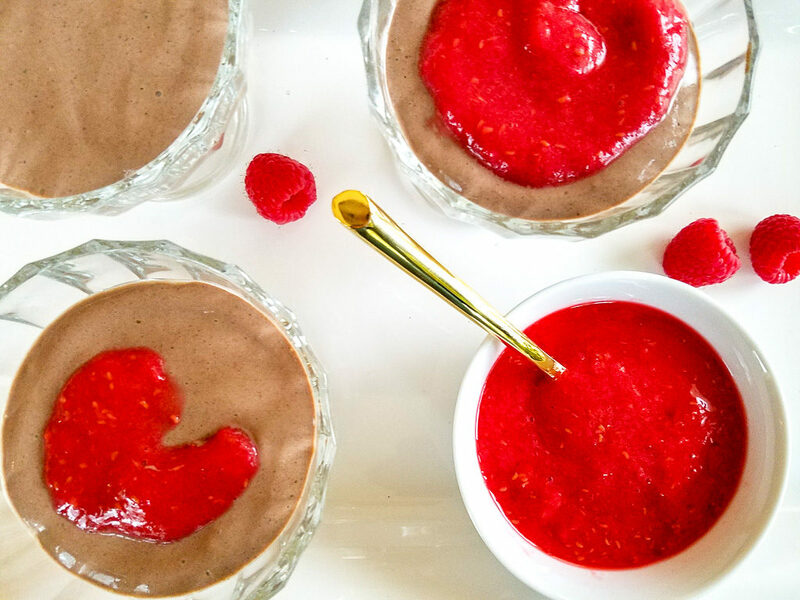 Pour pudding into individual serving dishes and smooth with a spoon if you plan on layering it with the raspberry puree later. Refrigerator for at least an hour. 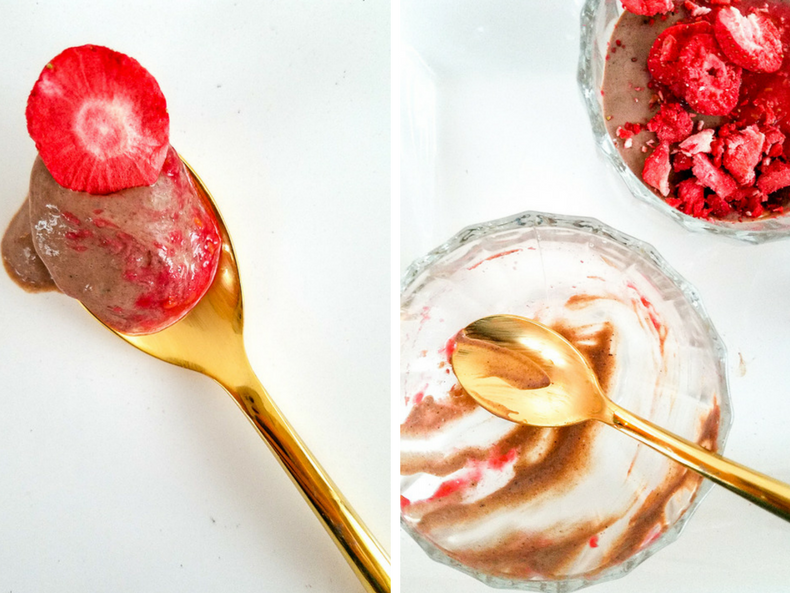 Once set, spoon on the raspberry puree, or add additional toppings as desired and serve. 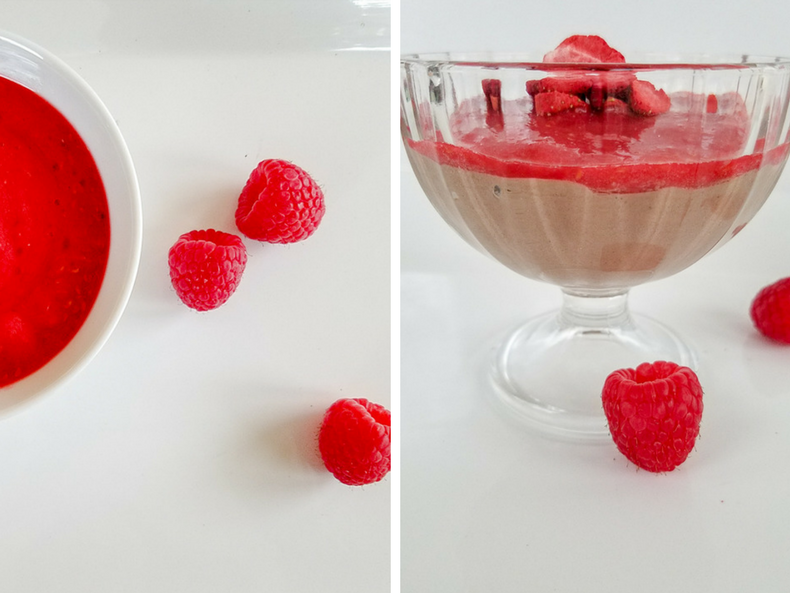 Puree the raspberries, sweetener and extract in a blender until the mixture reaches a pourable consistency.